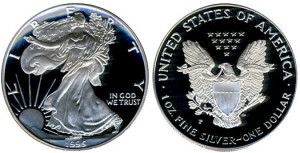 This page will cover the 1992 through 1997 releases of American Silver Eagles, and provide information about each edition of the coin. With the 1992 mintage of the American Silver Eagle coin, the series entered year seven. This year would see a decline in demand for the Silver Eagle in its bullion format. On the heels of three years of consecutive increase in mintage, mintage would fall in 1992 to around 5.5 million, a drop of greater than 1.5 million coins as the price of silver declined ever lower yet again, averaging $3.95 per ounce, with lows of $3.65 and highs of $4.33 per ounce. The Silver Eagle proof version also showed somewhat of a decline, with less than a half-million coins being minted. This was the second year that the proof fell into decline in its proof version, and this trend would follow the series for two additional years. Once again, the series proof was minted at the San Francisco Mint and was stamped with the iconic “S” mark. The U.S. Mint offered the coins at the direct price of $23 per coin, a price that had been seen for the previous six years. Collectors looking for certified Silver Eagles will find that there are NGC PF 70 Ultra Cameo coins on the market, although coins graded MS 70 are less frequently found. For collectors found in PGS holders, proof coins are hard to find while bullion coins are nonexistent. The price of silver rebounded in 1993 after lingering at low levels. With this increase in silver values, the 1993 American Silver Eagle coin mintage increased for the bullion coins and 7 million coins were sold to Silver Eagle coin investors and collectors. This temporary increase in sales suffered a decline for the next few years. These 1993 American Silver Eagles were the first proofs for the American Silver Eagle coins to be produced in Philadelphia, location of the United State’s first mint. They were marked with the “P” representing Philadelphia. This run of coins was subject to a decline in mintage, producing only a bit more than 400,000 bullion coins. 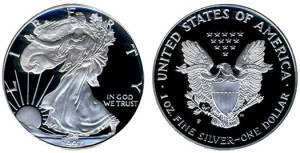 This production holds the second lowest mintage amount for this series of regular proof American Silver Eagle issue coins. Interested collectors will have to search many avenues to find perfect graded certified 1993 American Silver Eagle coins. Lower mintage amounts made for this coin and it’s high grade proofs to be in want by many certified collectors and dealers. Silver, at per ounce measurements, boasted the first increase in price in 1993. The opening price for the year was $4.31 per ounce and traded as high as $4.57 per ounce. After the American Silver Eagle coin’s slight increase in production in 1993, the 1994 American Silver Eagle coin mintage sat at just 4,227,319 coins. This small run of bullion was the lowest amount of coins minted for this coin series and remains the second lowest amount of coins minted for these Silver Eagle coins. The actual proofs for this 1994 American Silver Eagle coin were only minted at a small amount of 372,168. 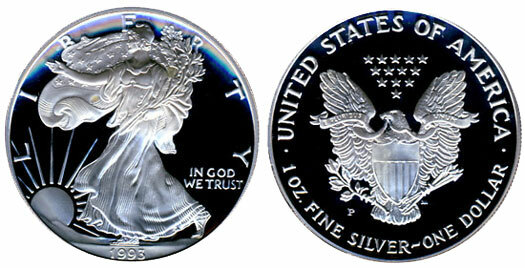 There was a special issue of this coin’s proof, the 1995-W Silver Eagle proof, and yet it holds the record for least amount of proofs minted for the series. The coins were produced at Philadelphia, as evidenced by the “W” mark on each coin and sold at the time for $23.00 each. Certified collectors and coin dealers will find these coins, both the bullion version and the proof coin, to be priced at higher than normal amounts because of the smaller number of coins minted. These coins and proofs are also hard to locate and procure. In 1994, the price of silver sat at a high in March when it reached $4.78 and ended the year in December at its lowest price, $4.78. Silver averaged $5.28 per ounce throughout the year. The 1995 American Eagle coin commemorated the tenth year this well-received Silver Eagle coin series was minted. These standard one ounce silver coins, produced as bullion by the US Mint, were minted at 4,672,051 coins. Because 1995 was the tenth year since the start of this Silver Eagle series, the US Mint produced two versions of this 1995 American Silver Eagle proof. Each proof was different and allowed coin collectors a unique proof as the program’s tenth anniversary was celebrated. The first standard issue proof coin in this collection was the 1995-P Silver Eagle Proof. Being minted at the US Mint in Philadelphia, the proof bore the “P” mark designating where it was minted. 500,000 coins were minted and sold for $23.00 each. The 1995-W Silver Eagle Proof coin is extremely rare, and was produced as part of the 10th Anniversary Gold Eagle Proof set. This anniversary set included four magnificent items for serious collectors: four Gold Eagle proofs and a West Point US Mint Silver Eagle proof marked with a “W” for West Point. This commemorative collection came at a high cost and only 30,125 sets were produced. Although the Gold Eagle proofs were normally minted at lower amounts, this set was the smallest American Silver Eagle mintage created. Certified coin collectors can expect to pay upwards of $10,000 for the 1995-W proofs. The per ounce cost of silver peaked in 1995 at $5.00 in May and sunk to $4.65 per ounce in March. The price averaged $5.20 per ounce in this year. In 1996, the American Silver Eagle coin mintage numbers set the record for the smallest amount of bullion coins produced in this Silver Eagle series. At only 3,603,386 coins, the 1996 American Silver Eagle bullion provided the basis as new silver bullion demand provided for increased mintages over the next several years of production. This rock bottom mintage allowed bullion for this 1996 American Silver Eagle coin to be priced much higher than other bullions. The 1996 Silver Eagle Proofs were offered by the US Mint at a price of $23.00 for each coin. Setting the production limit at 500,000 coins caused collectors to buy the entire inventory and it sold out quickly. This absolute sell out was the very first time a coin was sold out completely since 1990 when the US Mint established a maximum authorized limit on mintage of coins. This marked the first time an investment grade silver coin was issued by the U.S. Mint. In 1996, silver was priced at an average of $5.20 per ounce with a wide range during the year from a low of $4.71 per ounce to a high of $5.82 per ounce. Although the US Mint produced 4,295,004 1997 American Silver Eagle coins, the mintage ranks as the third least amount of coins produced by the US Mint. This total amount of coins is more than only two other years, 1994 and 1996 with low mintage amounts for this series. Although the 1997 American Silver Eagle coins were limited to a maximum authorized mintage of 500,000 for collectors and given the ranking of third lowest amount of coins, this coins only boast a slightly higher cost than other mintage dates in this Silver Eagle series. Each coin carried a price set by the US Mint at $23.00. In 1997, Secretary Robert Rubin authorized the US Mint to produce the nation’s first platinum coins releasing the new American Platinum Eagle. Along with these new platinum coins, the Impressions of Liberty Set was introduced containing one ounce Gold, Silver, and Platinum Eagle coins. This special product was limited to only 5,000 sets and even with a premium price set at $1,499.00, the sets were soon completely sold out. During 1997, the price of silver per ounce held within a narrow range, averaging $4.91 per ounce. In December, the price per ounce broke $6.00.